Blue kyanite crystals: A very common habit of kyanite is blue bladed crystals. Image by Aelwyn, Creative Commons license. Radiating kyanite: Sometimes kyanite occurs as radiating masses of crystals such as this specimen from Petaca, New Mexico. Specimen is about 4 inches (ten centimeters) across. 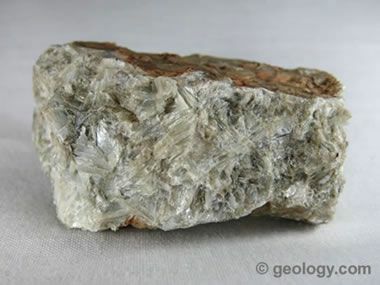 Mohs Hardness Kyanite often occurs in long, bladed crystals. 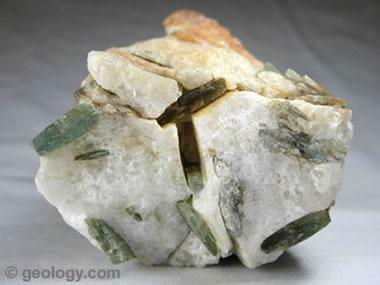 These have a hardness of 4.5 to 5 along the length of the crystals and 6.5 to 7 across the width of the crystals. 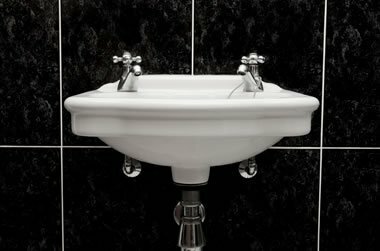 Kyanite porcelain sink: Kyanite is used in the porcelain of sanitary fixtures. Image copyright iStockphoto / Carl Kelliher. Kyanite spark plug: The porcelain insulator on this spark plug was made with kyanite. Image copyright iStockphoto / Juergen Barry. Kyanite cutting wheel: Kyanite is used as a heat-resistant binding medium in cutting tools and grinding wheels. Image copyright iStockphoto / Ron Sumners. Kyanite cabochons: Kyanite is often cut "en cabochon" or as a faceted gemstone. Shown above are kyanite cabochons ranging in color from clear to blue to green and black. Kyanite is a gemstone that you will rarely encounter in the typical jewelry store. Most people have not heard of kyanite, as it is infrequently used in jewelry. It is an "exotic" gem. Perhaps that is what makes it so interesting? If you are interested in kyanite as a gemstone or in jewelry, the best place to find it is in artisan jewelry stores or in jewelry stores that are associated with a mineral dealer. 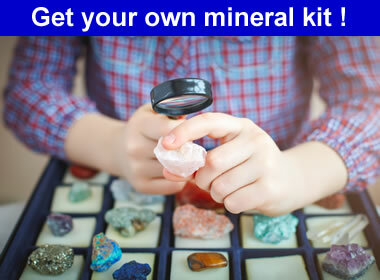 The people who own these businesses are likely to be interested in kyanite and incorporate it into their product line. 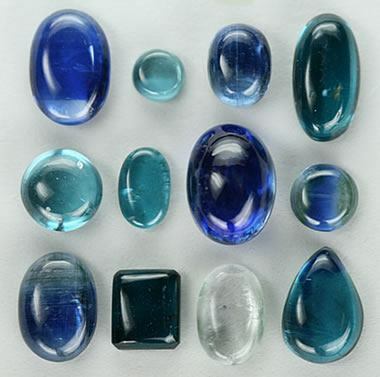 High-quality and nicely colored kyanite can be cut into attractive and desirable cabochons and faceted stones. 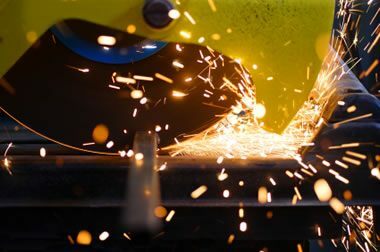 These are often used in rings, earrings, pendants, and other jewelry. Kyanite is also used to make beads. These beads often have a flat geometry because the mineral typically occurs in thin blades. Faceted kyanite: A faceted kyanite gemstone with a beautiful deep blue color. Green kyanite crystals: Green kyanite blades in quartzite from Avery County, North Carolina. Specimen is about four inches (ten centimeters) across. 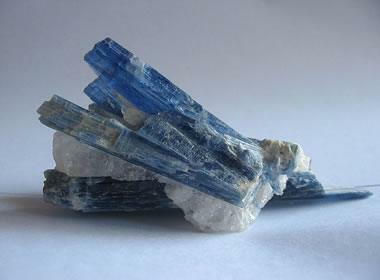 Most gemstone-quality kyanite is blue in color. 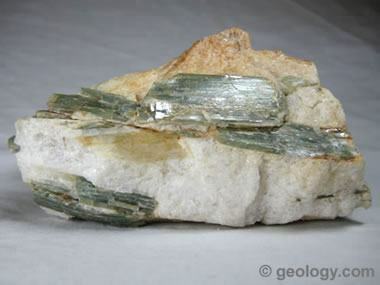 However, kyanite can be clear, green, black, and rarely purple. Some kyanite gemstones are pleochroic (appear to be different colors when viewed from different directions). Blue kyanite stones can be found in a continuous color range between clear and dark blue. 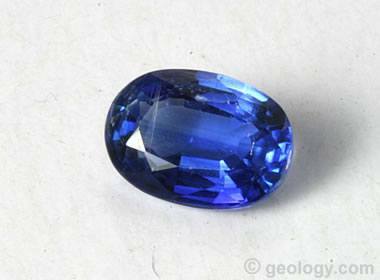 The most popular kyanite gemstones are transparent with a deep sapphire-blue color. Some deep blue stones are shown in the photos on this page. Transparent blue kyanite with a lower color intensity might look like blue topaz or blue aquamarine. Green kyanite crystals: Green bladed kyanite (same specimen as above) - looking down the long axis of the blades. Specimen is about 4 inches (10 centimeters) across.